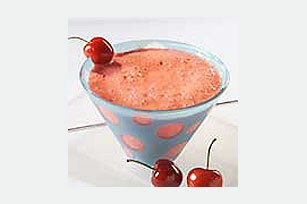 Cherry yogurt and sugar-free cherry flavor drink mix are added to milk, bananas and ice for a blast of cherry flavor in this chilly kids’ blender drink. Place all ingredients in blender; cover. Blend on high speed 30 sec. or until thickened and smooth. Place remaining drink mix in glass or plastic pitcher. Add 1 qt. (4 cups) cold water; stir until drink mix is completely dissolved. Serve over ice cubes in tall glasses.